The Village Carpenter: Have You Seen This Table? No, but I'm very interested in how the long side aprons attach to the short side. I bought a Sigue Sigue Sputnik album once just for a quote on the back of the disk. I'll be happy to check the exhibits at the St. Louis and KC Art Museums the next time I visit and let you know if they have anything along this line. Sigue Sigue Sputnik... Affordable Fire Power! Trevor, I'll probably use dovetails unless I can find a better image. I suppose you could use hidden, mitered dovetails for strength and show. TJIC, glad to hear I'm not alone! Thank you, Harry. I ran the title through google translator and it's furniture joinery. Thank heavens for translator sites. There are several similar tables in a set of excellent German books, Mobel Europas by Franz Winisch-Graetz (Munich, Klinkhardt und Biermann, 1982). 2 vol., the first being medieval and the second Renaissance furniture from all over Europe. These books are some of the best resources for early European furniture I know of. The aprons of these tables form boxes which are accessed by tilting the table top. Dean, as the ducks are an integral part of the design of the table, I feel it necessary to carve them first. Their shape will no doubt inform the overall balance, hierarchy, and symmetry of the piece. John, thank you for the reference! I'll try to find it in a library as the price is a wee bit salty for me. I assumed the table top rode on sliding dovetails so I'll have to rethink this. Hinges would certainly be easier to install, but the ducks would topple every time you had to fetch something inside the box. There’s a table too?! Oh, that’s right, integral, integral! “Their shape will no doubt inform the overall balance, hierarchy, and symmetry of the piece.” I gotta remember that line! I can’t find any references showing a joint that would likely have been used to build the case top of your table. 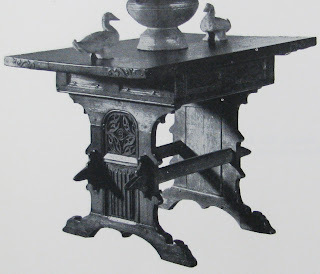 Considering it is four to five centuries old, and from what I can see in the picture, I don’t think it is dovetailed, and I don’t think the ébénistes of that time and part of the world would have used something as sophisticated as the Chinese joinery shown in Ecke. The photo in my copy of Hinckley is no better than what you posted. So, I will make a guess, based on what I can see, from it’s age, and from the fact that it has survived, which implies competent joinery. Basically, the construction of the box between the top and the trestle is post and frame and panel. But it is obvious that the rails are not tenoned on the ends and mortised into the corner posts. I think the top and bottom side rails are joined to the end rails with bridle joints, but it appears that all but the last 1/4” of the end grain of each rail is covered with the long grain of the adjoining rail. I think there is a mortise cut through each bridle joint, and a matching tenon on each end of the corner posts. The joinery of the tops of the trestles to the case is a bit more problematic. The grain on the top trestle members runs the wrong way to tenon them into the bottoms of the case rails, but pegs or screws would work. Something else you will find a bit challenging is the panel in the trestle ends. It is square on the back side, but arched on the front side. The joinery of the trestle ends should be obvious, as the drawbore pins show you where the tenons are. There is a similar table on page 356 of Wallace Nutting’s Furniture of the Pilgrim Century. He calls that one a kitchen table, but Nutting said all sorts of controversial things. Check out this 1. Medieval site and 2. Blogger (box trestle table)... you may have already. The Chest/table top uses a sliding rail to attach its top... the site has some interesting pieces (see furniture, trestle table etc under "label" sidebar). Good luck w. your research! Blowing up that image shows discolorations on the left end of the near short rail that look like the end grain of 3 or possibly 4 dovetails. Seems consistent with a not-too-complex joint that's good enough to survive the years. I notice there are notches on top of the feet of the table. Possibly a strap went over these areas to secure the table to the floor. Possibly to a ship deck. Or, it could be just part of the design. Just thinking of possibilities, but don’t know. I forgot to add this in the previous post. That is the possibility that the notches in the feet, may have held a board to serve as a foot support while sitting at the table. Sixty grit, there is something a bit overwhelming and even unattractive about it, but for whatever reason, I was drawn to it. It will certainly be a fun challenge to build even if it doesn't fit my décor. William, I was wondering the same thing about why the builder made the leg panels square on the back but arched on the front. I've never seen that before but then I've never inspected any period pieces with an arched door. Maybe they're all like that. Thanks, Julian. Someone else had suggested the Thomas Guild site which is a fantastic resource. I've found a bunch more sites through that one, as well. Another friend sent me a link to Ron Cook's site and I emailed him but he hasn't written back. You guys are a lot better at finding resources than I am! I believe you're right, Tom. I had planned to use dovetails anyhow, but it's nice to know I'll be using the same joinery as the original. Those are interesting thoughts, Dean. The board across the feet would certainly make it more comfortable to sit at the table. I suppose the scrolls could be merely decorative, but it's fun to ponder. I agree Kari, it could very well be just how they designed the feet. However, the notched area seemed a bit abrupt to me and doesn’t seem to fit into the overall design of that area, being more like a square notch with its 90 deg angles. Not being a furniture designer in that era (or culture) leaves me clueless as to what they considered a “good” design element. There are several similar tables in European museums, especially in Germany. I have some photos if you are interested in details. This is a project I have contemplated for some time! The box on which the top rests is indeed dovetailed. As seems typical for late 15th to early 16th c. dovetailing, the tails are large and cut at deeper angles than most modern tails. The top often, but not always, is attached with a sliding dovetail. Frequently the top is two wide pieces hinged together to fold flat. A resource for construction details is "Die Konstruktion alter Mobel: Form und Technik im Wandel der Stilarten" by Erich Klatt, pub. Julius Hoffmann Verlag Stuttgart, 1961. Hard to find... I only have copies of a few pages.